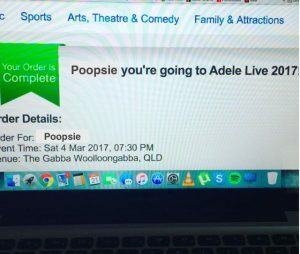 Many of our readers will remember late last year, we purchased tickets to the Adele concert in Brisbane. At $150 each, this was not a frugal purchase. However, it was a concert I desperately wanted to attend and the cost was well within the boundaries of what we could afford. Now, for most people, the $150 ticket would merely have been the tip of the iceberg. But for us, we wanted to make sure it was the entire iceberg and that we did the whole night as frugally as possible. Most people attending the concert were actually able to do this quite frugally. For ticket holders, train and bus transport to and from the concert was free. However, on the night we attended, there were 65 000 other people going. We knew that this would be a nightmare on public transport, especially as we live about an hour away via train from the venue. Poopsie put his thinking cap on and checked out The Gabba website. 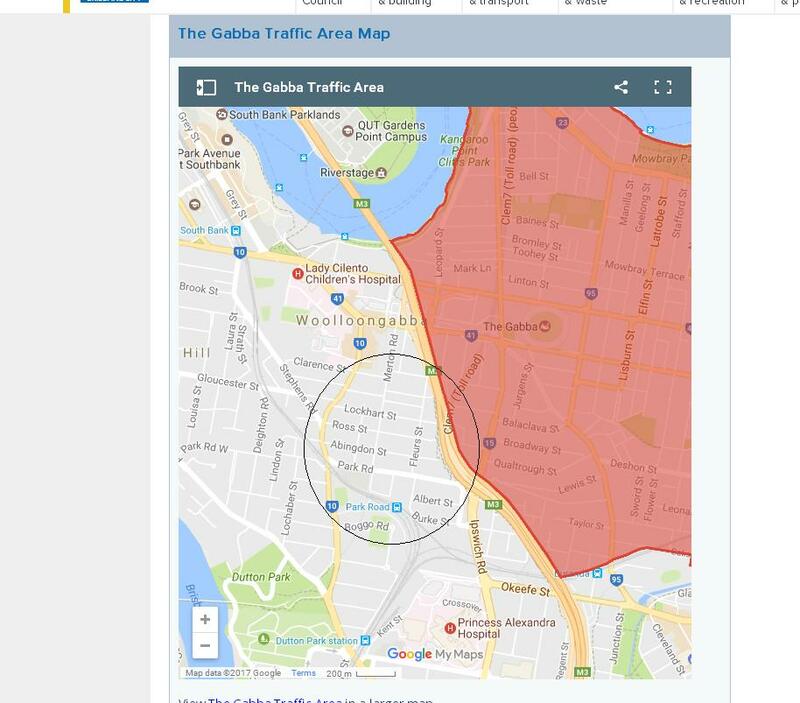 On days when events are on, there is a parking exclusion zone around The Gabba. If you park in this zone, you’re going to get a fine. But outside the zone, you can park fine free (as long as you still obey the parking restrictions on individual streets). We parked in that circled area. Poopsie located a street just outside the zone and we keyed that into our GPS. We left pretty early, not wanting to hit too much traffic, and we didn’t. We cruised into the street, parked our car and commenced the six minute walk to The Gabba. That’s right. By being willing to walk six minutes, we beat the crowds on public transport and avoided paying for parking. We were very happy with this- especially Poopsie. Whenever we have caught up with friends since the concert and they ask how it was, Poopsie immediately tells them this parking story. Most of them give him an odd look and then turn to me where I explain how fantastic the actual concert was. My parents were also attending the concert so after our six minute walk, we found them waiting on a grassed area. This area had a number of food vans spread around it and many of them had long lines. People, including my parents, were purchasing food and drink. For most, it was probably dinner. At about three thirty that afternoon, I had whipped up a delicious pea risotto and Poopsie and I enjoyed an early and very filling dinner. I had also checked the concert website and it stated that, as long as it was still sealed, water bottles could be taken into the venue. The day before, Poopsie had done a grocery shop and purchased a 1.5L bottle of water for sixty five cents! Once in the concert, people continued to purchase food. My parents purchased some drinks. They generously offered to buy some drinks for us, but we were happy with our bottled water (although I did have a few sips of my dad’s coke). The venue starting to fill up at about six thirty- still an hour away from the performance. The gates opened at five thirty but the concert was not due to start until seven thirty. A lot of people, us included, spent those two hours in their seats (better than sitting on the grass outside). Many of those around us spent this two hours eating and drinking. One woman sitting in front of me purchased four Daiquiri’s before the concert had even started- at $11 a pop! She also had a glass of champagne, a plate of food and an ice cream. Her husband ate roughly the same amount and had at least one beer. Between the two of them, they probably had close to $100 of food and drink before the concert had even begun. There was a lot of merchandise for sale, as there is at most concerts. The line for the merchandise tent was long. My mum told me that one of the t-shirts you could buy was $85. Whoa! Plenty of people purchased posters and programs. A boy sitting in front of Poopsie purchased a program and was leafing through it. We were able to have a look at it over his shoulder (the ultimate frugal way of reading a program… or perhaps just cheap) and while it was tastefully done, it was really just a book of photos of Adele, all of which, I am sure, are available for free online. I understand people, especially children, get excited about attending concerts and want to commemorate it. But the prices are hugely inflated. As we were leaving the concert, about two streets away, a bunch of people were selling identical t-shirts for $10! We heard one woman behind us getting very annoyed because she had spent $85 on her shirt inside the concert. We walked six minutes back to our car. Knowing that we would probably be a bit hungry, I had packed a small esky with some drinks and that morning had baked a batch of berry muffins. As we merged onto the highway, munching on delicious muffins, I realised we hadn’t spent a cent all night. About twenty five minutes later, we pulled into our driveway, absolutely ecstatic about the awesome and frugal night we’d just had. How do you stay frugal at big events like concerts and sporting matches? Share your tips below! Poopsie and the parking story! That was a pretty fantastic find, though. Goes to show what you can do when you plan ahead. I was coming home from work, and saw the crowds on my station, heading in to the concert. Would have been tricky getting home. Oh, once upon a time those two people sitting in front of you with the daiquiris and food would have been us! These days I would also try to eat before we got there, and maybe have some muesli bars or fruit for on the grass. Having an Esky ready for the end of the concert is an excellent idea, something I wouldn’t have thought of. Sometimes we used to stop at a Maccas on the way home. Not only is it junk and costly, but everyone else has the same idea! Planning ahead is definitely worth it! There was a time as well when I would have purchased something there too. But not only do we save some money, but it’s also a lot healthier to bring our own food or eat beforehand. I try to bring my own snacks to sports games. Stuff at the stand is ridiculously expensive, and since I’m on a low-carb diet, I basically cant eat the pizzas, hot dogs, etc. You’re definitely right, Troy. Anyone who is health conscious would not buy food at these events! They’re never healthy. We’d much rather eat our own healthy food and just enjoy the game/show. Nice post! 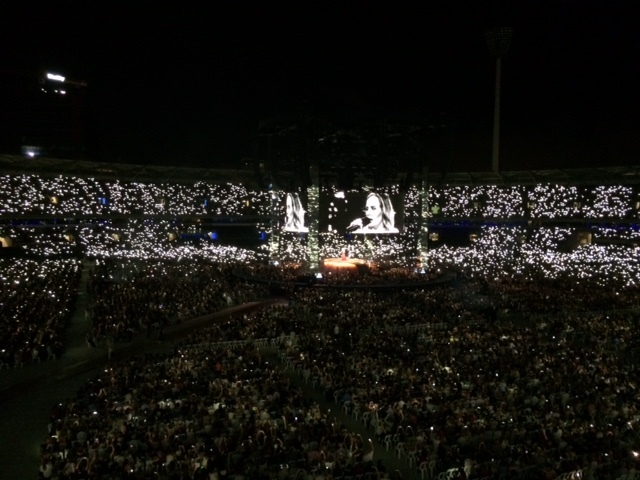 I also went to see Adele with my hubby here in Sydney. It did hurt a bit to pay $150 per ticket, but she is my idol and seeing one of her shows was on my bucket list. It was worth every cent, and it’s nice that being frugal in daily life allows you to splurge every now and then on experiences that are really worth it. Oh I am so glad you got to tick something off your bucket list. We agree, she was definitely worth the money!